The Girls of the Finest 2016 Calendar project is now 87% funded! That’s a fantastic total and one that the online community should be proud of. These lovely ladies have so far raised $7,380 of their $8,500 goal to help support the USO. However, their not resting on their laurels just yet– the Girls of the Finest 2016 calendar project still has 13% of their goal to go! If you’re on the fence about supporting this project, this is the time to step forward! A simple contribution of $25 secures one printed copy of the 2016 calendar, as well as a unique postcard and trading card from the photo shoots! Sure, you could go out and buy any old calendar for the office or the Joe room for next year but wouldn’t you much rather show your support for the USO by backing the Girl’s of the Finest 2016 calendar? However, don’t take my word for it– here are some words of encouragement from members of the finest themselves! To show your support, visit the Girls of the Finest 2016 Calendar project on IndieGoGo today! With your help, this project can succeed! The 2016 Girls of the Finest Calendar drive is now 70% funded with just 12 days to go! What a project! As we discussed previously here at JBL, the lovely ladies of the Girls of the Finest calendar from 2015 are back and are once again asking for your help in raising funds to support a worthy cause. Even better, they’re offering an amazingly high-quality 2016 calendar as an incentive for folks to donate to the project– with the proceeds going to benefit the United Service Organizations. The Girls of the Finest, members of a G.I. Joe costuming club, are back with a brand new calendar project! This year the proceeds are going to the USO – the United Service Organizations that provides comfort to our overseas troops! Last year’s project was an amazing success that raised funds for the Wounded Warrior Project. Not only did fans help the Girls of the Finest produce a terrific fan-driven G.I. Joe calendar but they also helped support a fantastic cause in the process. 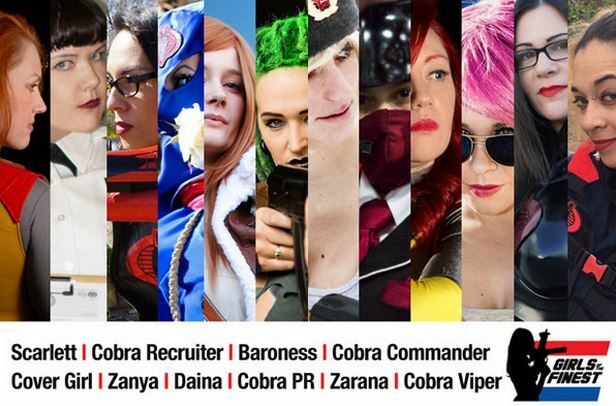 This year, these talented female costumers are hoping to recreate the lightning in a bottle of last year’s project and help the USO at the same time! C’mon– it’s a win-win! Get a great calendar featuring the talented Girls of the Finest and help send some much needed comfort to our fighting men and women overseas. Girls of The Finest Calendar is A-GO!!! Congratulations to the Girls of The Finest on reaching their calendar goal! As previously reported here at JBL, the Girls of The Finest have launched their own calendar project to benefit the Wounded Warrior Project. With 12 days left they’ve beat their goal of $7500.00 and have raised a total of $8175.00! That’s right– not only is the calendar project guaranteed to happen but these lovely ladies have raised over eight thousand dollars to help out our wounded veterans! C’mon Joe fans– let’s push them over the top, help the brave men and women who receive assistance from the Wounded Warrior Project, and get a slick fan-generated calendar to boot! The deadline to fund the project is April 11, 2014 so make your contribution today! The fans of the G.I. Joe community are some of the most charitable around. Countless times have I seen fan groups holding events and raising funds for charity– giving of their time and energy to help those who are less fortunate. Such is the case with The Finest – a G.I. Joe costume club whose current IndieGoGo project is helping to raise funds for the Wounded Warrior Project. The premise is this– for a contribution of $25.00 on their IndieGoGo project site, fans will receive a full color printed calendar (as well as a digital .PDF copy) featuring “the Ladies of the Finest” in some fantastic G.I. Joe-themed photo shoots. It’s all tastefully done and features characters both familiar and brand new! It’ll be a perfect way to start off 2015 and help our wounded veterans as well. However, there are multiple contribution tiers as well– each with their own unique contribution rewards! Remember, once printing costs are covered, all proceeds will go to the Wounded Warrior Project! With 46 days left they’re just over halfway to their stated goal of $7500.00. C’mon Joe fans– let’s push them over the top, help the brave men and women who receive assistance from the Wounded Warrior Project, and get a slick fan-generated calendar to boot! The deadline to fund the project is April 11, 2014 so make your contribution today!